Book measures 6.25" x 8"
These Imagine Ink picture books use a mess free marker to reveal a rainbow ofcolors as you draw on the page. 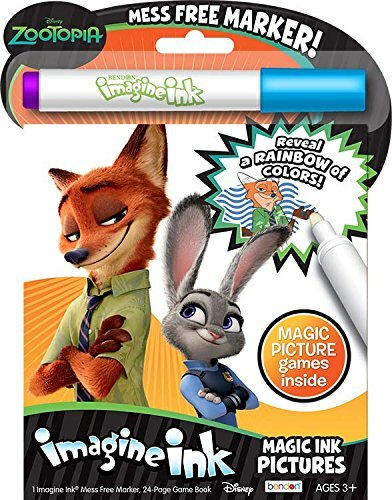 Designed to be used with the included MagicInk Marker, a clear marker that will not visibly mark most other items, theImagine Ink pictures books are perfect for travel, holidays, or any time.Bendon Publishing International Inc. was founded in 2001. Since its inception,Bendon has become one of the fastest growing children's book publishers in thenation. Bendon has maintained early success in part to our simple philosophyof listening to the customer and providing them what they want.